The back shell and plastron of the animal Chinemys reevesii (Gray) of family Testudinidae. Mainly produced in Jiangsu, Zhejiang and Hunan provinces in China. Captured all the year round. Killed, shelled. Slight raw meat smell, slightly salty. Big, whole, clean, without carrion. Unprocessed or quenched with vinegar. Sweet, salty, cold; liver and kidney meridians entered. Nourish yin of liver and kidney, subdue yang, strengthen bone, stop bleeding, nourish blood, and tonify heart. It is indicated for yin deficiency with yang hyperactivity, endogenous wind, and yin deficiency with internal heat due to liver and kidney yin deficiency, because it can nourish yin of liver and kidney, suppress floating yang which moves upwards. For dizziness, blurred vision, flushing with blood-shot eyes, impatience and temper lose easily due to liver and kidney yin deficiency, and liver yang flaming upwards, it is combined with yin-nourishing and yang-subduing herbs, for instance, it is used with Dai Zhe Shi, Tian Dong, and Long Gu in Zhen Gan Xi Feng Tang from Yi Xue Zhong Zhong Can Xi Lu. For yin deficiency with stirring wind due to yin injury by febrile, or yin deficiency led by long term disease, it is combined with yin and fluid-nourishing and liver-emolliating herbs, for instance, it is used with E Jiao, Sheng Di Huang, and Bai Shao in Da Ding Feng Zhu from Wen Bing Tiao Bian. 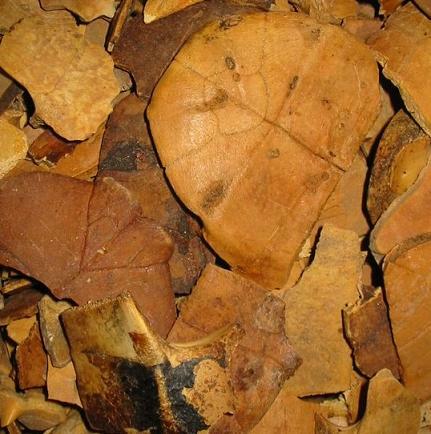 For bone-steaming, tidal fever, night sweat and spermatorrhea due to yin deficiency, it is combined with yin-nourishing and fever-relieving herbs, for instance, it is used with Shu Di Huang, Zhi Mu, and Huang Bai in Da Bu Yin Wan from Dan Xi Xin Fa. It can tonify and nourish liver and kidney, strengthen tendon and bone. For malnutrition of tendon and bone, atrophy and limpness of lumbar and knees, powerlessness when walking, or retardation of walking, delayed closure of fontanel due to liver and kidney deficiency, it is combined with liver and kidney tonics, tendon and bone-strengthening herbs, such as Shu Di Huang, Lu Rong, Niu Xi and Suo Yang. It can tonify liver and kidney, strengthen thoroughfare and conception vessels, and stop bleeding. It is very indicated for metrorrhagia, metrostaxis and large quantity of menstrual blood due to yin deficiency with blood heat, insecurity of thoroughfare and conception vessels because of its cool and cold properties. It is usually combined with yin-nourishing, heat-clearing and bleeding-stopping herbs, for instance, it is used with Bai Shao, Huang Qin, and Chun Pi in Gu Jing Wan from Yi Xue Ru Men. It can nourish yin and blood, tonify heart to induce tranquilization. For palpitation, insomnia, and amnesia due to yin-blood deficiency, malnourishment of heart, it is combined with mind-tranquilizing and will-strengthening herbs, for instance, it is used with Shi Chang Pu, Yuan Zhi and Long Gu in Kong Sheng Zhen Zhong Dan from Qian Jin Fang. Decoct 10~15 g. To raw material, be broken and decocted firstly. After stir-baked with gravel sand and dipped into vinegar, it is convenient to make pharmacological preparation because its effective ingredients are easy to be decocted out and got rid of smell of fish.